Usage/Application: APEX bowl with handle is mostly used as panchakarma accessories in Panchakrma centres. Assured quality and microwave safe products with versatile designs and stable colors. This double colour bowl with lid is made up off high quality food grade polypropylene. The lid matches the petals of the bowl to give a very good aesthetic appeal. 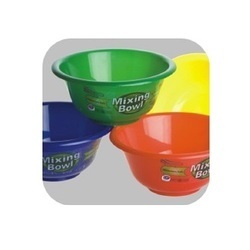 These Double Colour Bowl With Lid are available in sizes of 7. 5 inch & 9. 75 inch diameter. Matching up with the ever increasing requirements of the customers, we are engaged in providing Plastic Bowl. The global client base we have created Plastic Bowls for ourselves indicates the quality of the products we offer to them. Exquisite Plastic Bowls we offer to clients are one such example of our creativity and innovation. Owing to our advanced technologies and innovative machinery, we are able to manufacture and supply Plastic Bowl.